Even though 8 days away from ordination, getting it already from my students. Glad they mean it lovingly. In about a week I will be ordained an Episcopal priest. It is pretty strange, my whole life has been focused on my doing ministry, and I have always self-identified as being a minister. Starting about 8 years ago, I really felt pulled to leave my formative denomination and join the Episcopal church. 4 years of re-formation later, I am almost "Father" Rock. I put Father in quotation marks because that is a title I would never take on myself, but it keeps getting applied. That was a surprise to me. I wish my title could be Just Rock, I like the double meaning there, but people like their mental boxes and it has always been a term of respect so far. So, maybe it is something I need to get used to now that my big day is almost here. 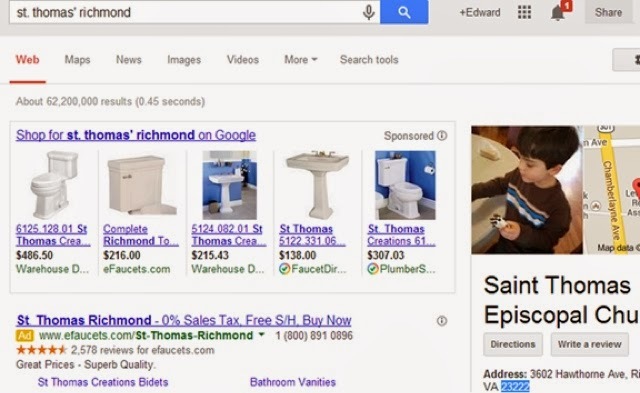 This morning, someone sent me a screen shot of his google search of my church, St. Thomas', and it makes us look like we are in the crapper. Thank goodness we are not. But, it is one way to start! Pax!